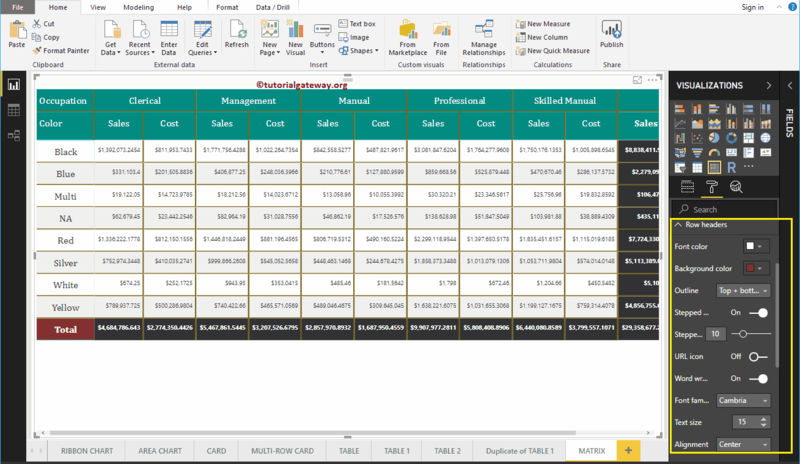 In this article, we will show you, How to Format Power BI Matrix report with example. 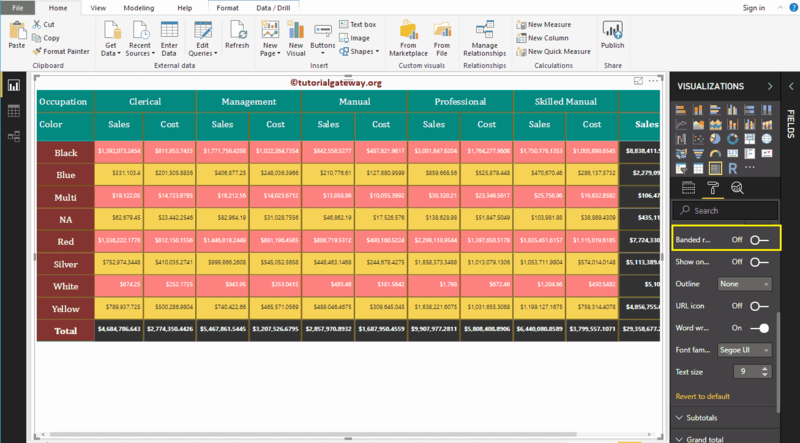 This includes changing the Matrix Grid Colors, Row formatting, Column formatting, row and column colors, Matrix Title text, and background color etc. 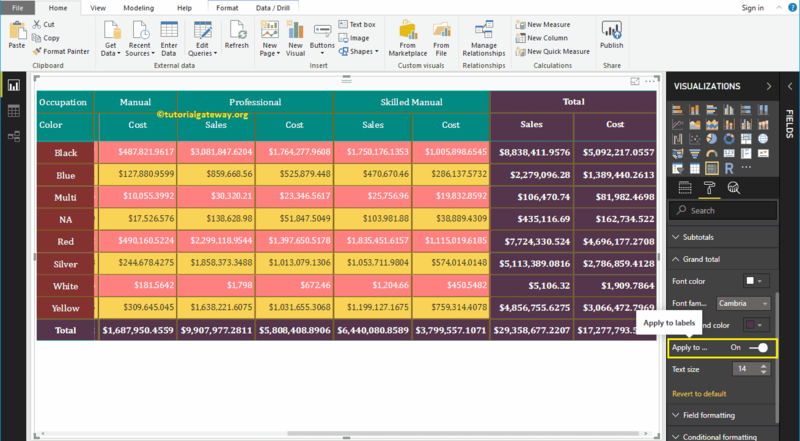 To demonstrate these formatting options, we are going to use the Matrix that we created earlier. 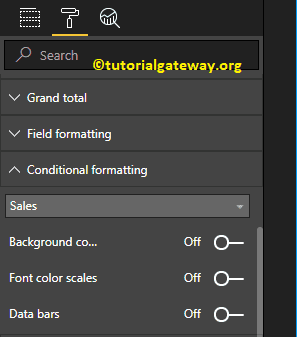 Please refer Create a Matrix in Power BI article to understand the steps involved in creating a Matrix. 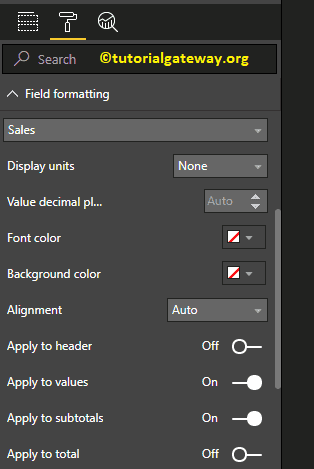 Please click on the Format button to see the list of Matrix formatting options that are available. From the below screenshot, you can see the list of styles that are available to style this Matrix. Please select any style as per your requirement. For now, we are selecting the Alternating Rows option from the drop-down list. 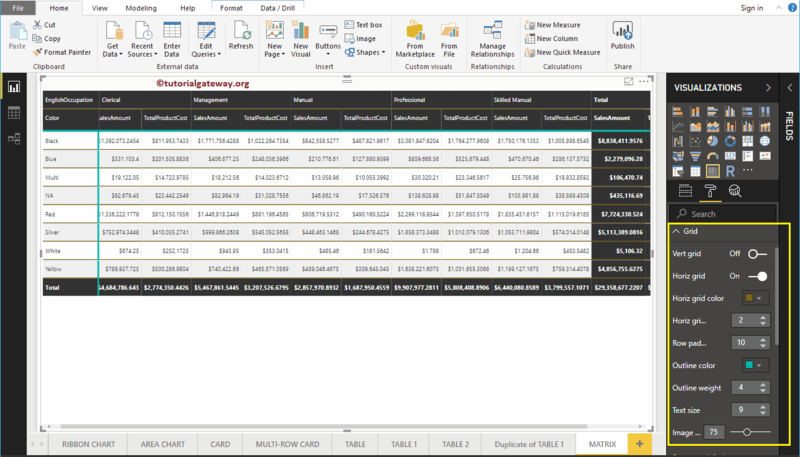 This will add alternative row colors, and adds Black color to Header, Subtotals, and Grand totals. 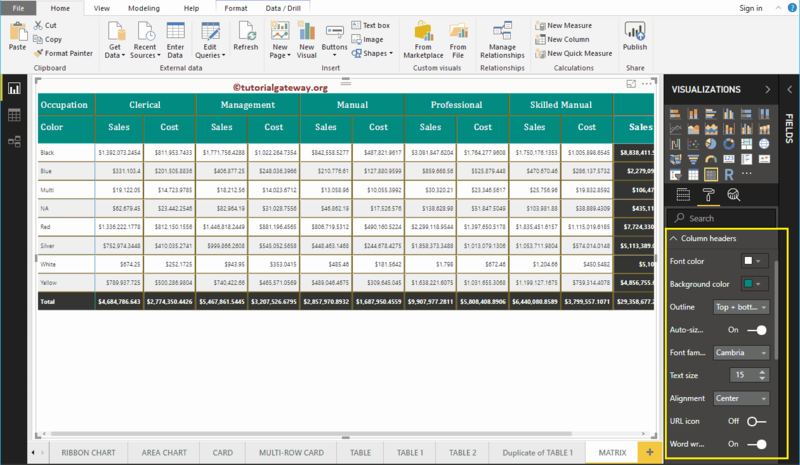 Following are the list of options that are available for you to format the Matrix Grid. 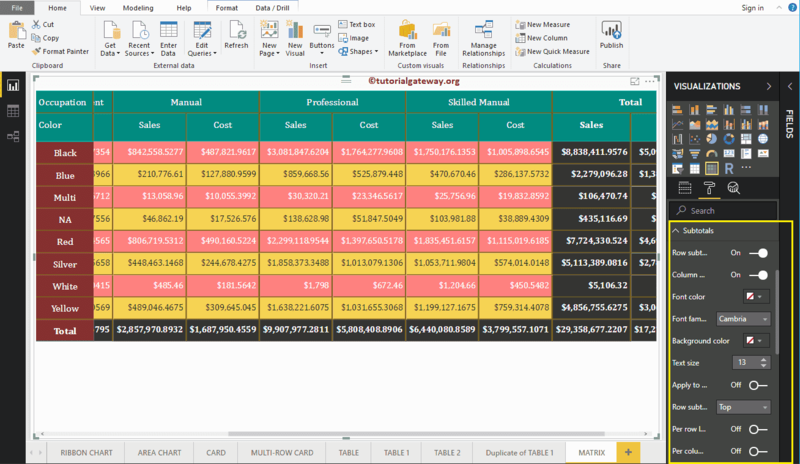 Vert Grid : Toggling this property from Off to On will add Vertical Grid to the Matrix. 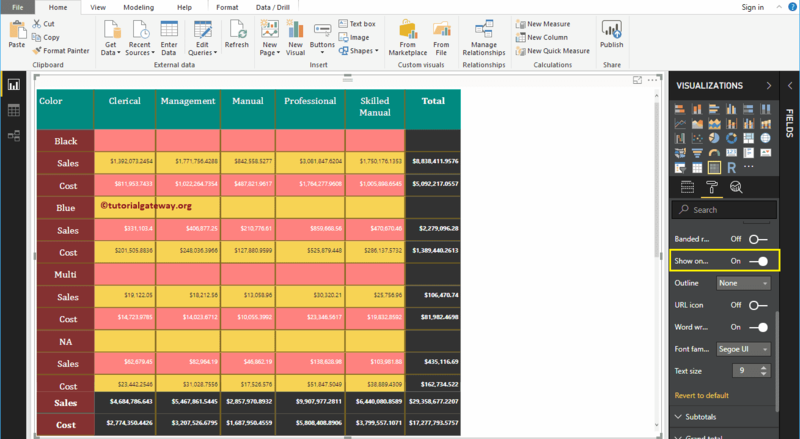 Nothing but enabling Vertical line to separate each column. Horiz Grid : Add Horizontal Grid. Nothing but enabling Horizontal line to separate each row. Horiz Grid Color: Changing the Color of a Matrix Horizontal Grid. Row Padding: Space between the rows. Outline Color: Color after the Header, and row group. We are using the default green as the Outline color. As you can see from the below screenshot, we enabled the Vertical Grid, and assigned some random colors. Vert Grid Color: Change the Color of a Matrix Vertical Grid. This section is used to alter the Header Colors. As you can see from the below screenshot, we changed the Font color to White, Background color to green, Font Family to Cambria, Outline to Top + Bottom (Outline will be added to the top and bottom of a Header), Text Size to 15, and Header text alignment to center. 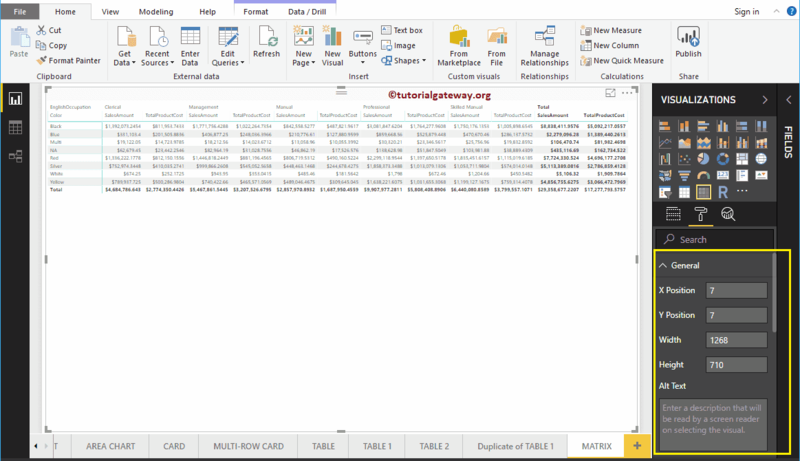 This section is used to alter or format the Row Headers section. Here, we changed the Font color to White, Background color to Red, Outline to Top + Bottom (Outline will be added to the top and bottom of each row), Font Family to Cambria, Text Size to 15, and text alignment to center. 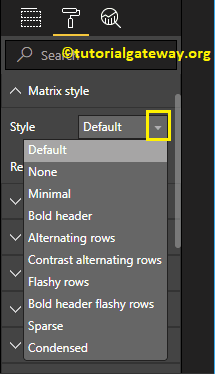 You can use this section to change the Matrix values. 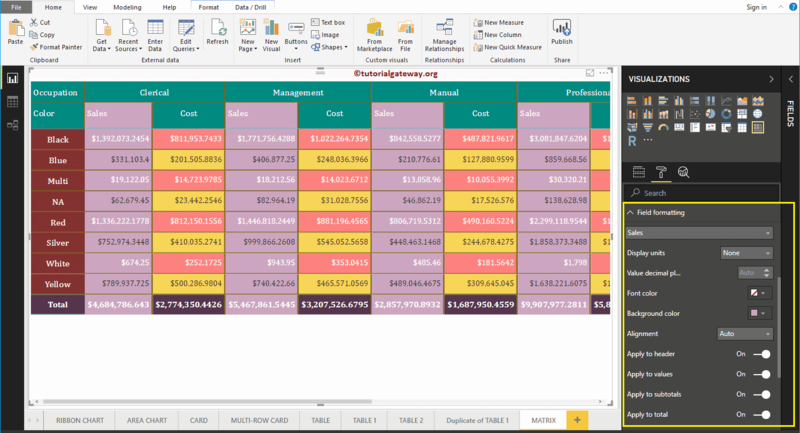 As you can see from the below screenshot, we changed the Font colors, and Back color of the even and odd rows. Banded Row Style: By default, it is set to On. 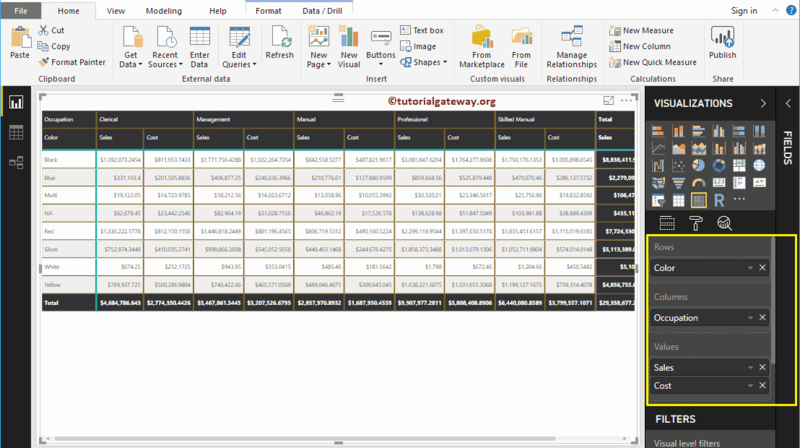 It means, Row Header color will be same as remaining Row fields. Use this subtotal section to alter the text and background color of subtotals. 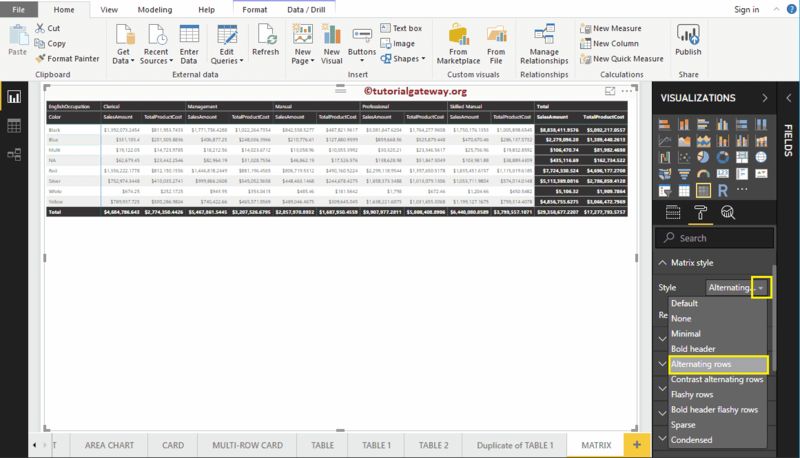 By toggling Row subtotals, column subtotals to Off you can remove the Totals completely. 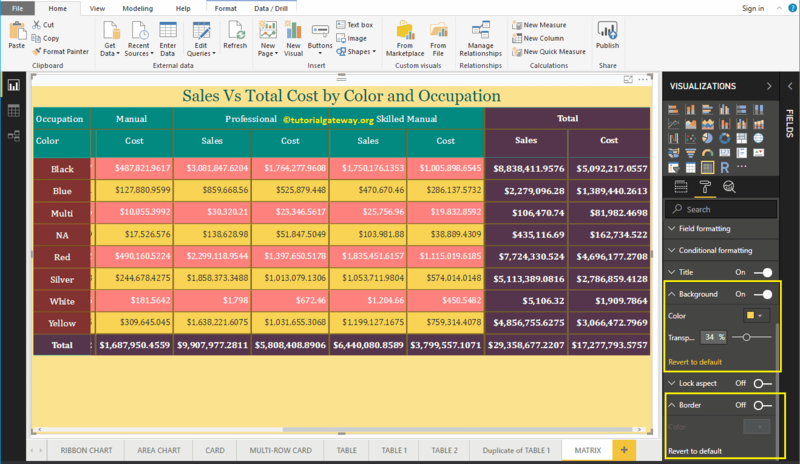 Use this Grand Total section to alter the text and background color of Total. 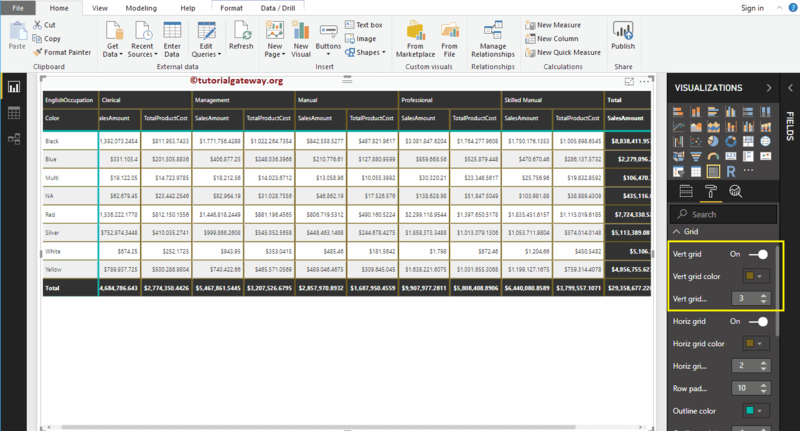 As you can see from the below screenshot, we changed the Totals Font color to white, Background color to purple, Font Family to Cambria, and Text Size to 14. 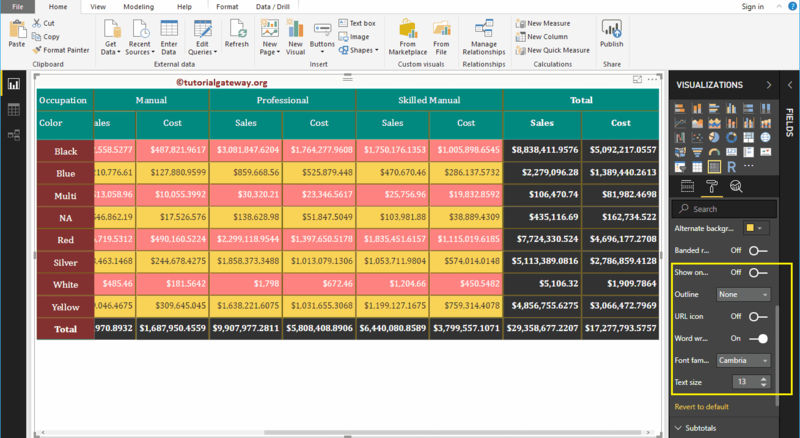 Use this section to format individual columns in a Matrix. 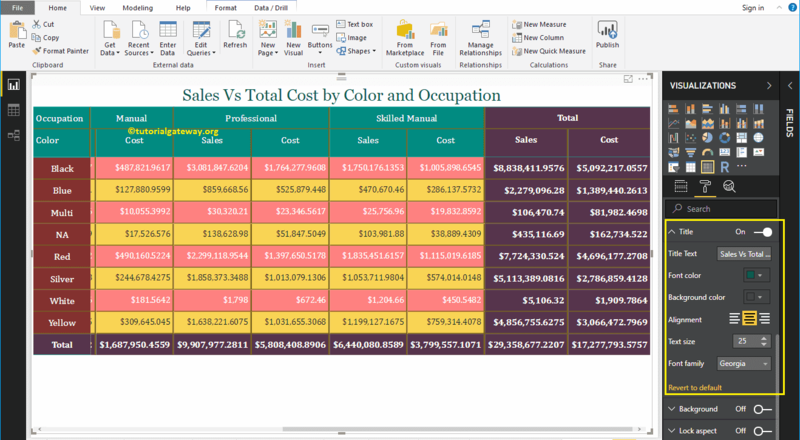 For example, you can use this section to assign a completely different color to one column. For now, we are selecting the Sales. For the demo purpose, we changed the background color to Pink for this column only. By toggling the Matrix option from Off to On you can enable the Matrix title. 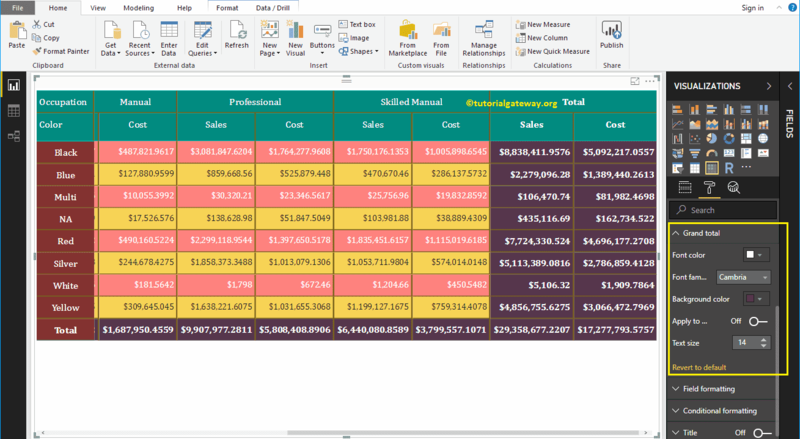 From the below screenshot you can see, we added the Title Text as Sales Vs Total Product Cost by Product Color and Occupation. Next, we changed the Font Color to Green, Font Family to Georgia, Text Size to 25, and Title Alignment to center. If you want, you can add the background Color to the Matrix title as well. You can add Background color to a Matrix by toggling Background option to On. For the demonstration purpose, we added sky pale yellow color with 34% transparency. 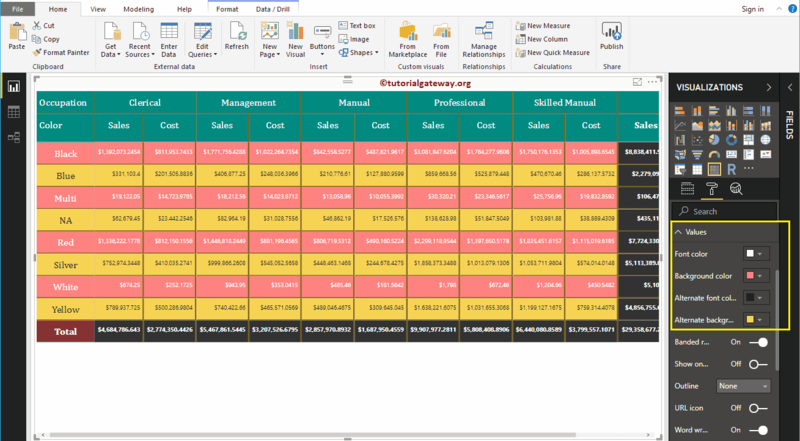 Similarly, by toggling Border option from Off to On you can add Borders to a Matrix.